Even though our winter has been a relative breeze, I'm looking forward to seeing bright crocuses poke through the ground... meanwhile, these vellum origami flowers nicely fill the void. Nikki Cross Applesauce is owned by Nikki and her husband, Jake. 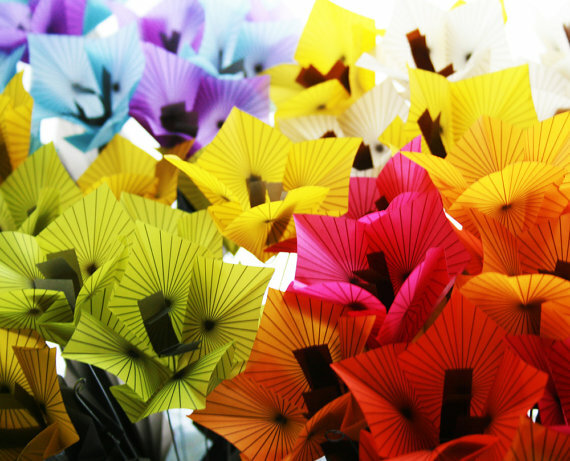 With a love of graphic design and paper, they create and cut their own beautifully translucent origami sheets. Nikki makes the blooms using traditional Japanese folds and adds in a few tricks of her own; even the stems are hand wrapped with paper. The LA-based pair also design stylish eco-cards, stationery, sketchbooks, and if you are a maker yourself, you may be happy to hear the vellum sheets are available by the dozen. Nikki kindly offered a 10% discount to All Things Paper readers when I let her know their shop would be featured today. Coupon code is "TOTALLYRAD". Lovely. I'd like a room of my own filled with these bouquets. Oh,tonight,you killed me with your smile,/so beautiful and wild,/so beautiful and wild ! Vellum! I'll have to try it. Oh wow these are beautiful! I could use a whole vase on my kitchen table of these colors! Such brilliant colours! really fabulous. Hope you are having a great weekend, Ann! Ohhh... they're lickable... if you know what I mean! The stripes on the paper make all the difference - lovely! Nikki Cross Applesauce *does* make wearable paper jewelry...message her about it...the pieces are pretty cool! So glad you all enjoyed seeing Nikki's flowers, and Anon, I'm glad you posted... how nice to hear she is already making paper jewelry!